Mordaunt-Short Aviano 5.1 review | What Hi-Fi? ‘Burly' is the word we'll be returning to here. It's not just that £2000 chucked Mordaunt-Short's way is enough to buy four floorstanding speakers (which makes for a prodigious visual statement and saves on speaker stands or brackets at the rear), it's also that the sound of this Aviano 5.1 configuration is every bit as beefy as the looks imply. Thanks mostly to the Aviano 8s up front and the Aviano 6s serving as rear channels, there are as many drivers involved here as you could reasonably expect at the price. In the middle is the Aviano 5, the only centre speaker in the Aviano range. The Aviano 7, the less imposing of two Aviano subs available, handles subwoofer duties. Finish is fine, if nothing special, involving as it does a lot of vinyl wrap and a couple of rather ill-fitting floor spikes. Serving up the exemplary Dolby TrueHD soundtrack to The Dark Knight, the Avianos demonstrate the sort of unquestionable brawn and tightly packed purpose more usually associated with successful heavyweight boxers. 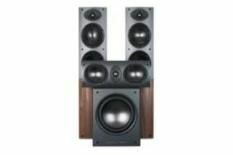 Low frequencies hit hard, dig deep and are modulated well, while the subwoofer's integration is smoothly accomplished. Dialogue is muscularly distinct, the Aviano 5 able to project ahead of even the noisiest action movie set-pieces. The soundstage isn't the biggest, but it's brilliantly unified, and there's real speed and coherence around the circle of speakers. There's ample dynamic reach, too, and thanks to its deft detail retrieval the M-S ramps up atmospheric tension nicely. These steroidal levels of attack can be rather wearing over the length of a film, though, and the centre speaker can get a little glassy and hard when the soundtrack gets shouty. There's no doubting the Aviano system's lucidity or solid, burly fidelity, but we think £2000 spent on a speaker package should buy a little more light and shade than the M-S can muster. Unless your sonic taste begins and ends with ‘up front', of course, in which case you'll be in hog heaven here.